The end of summer offers a seemingly endless supply of zucchini and corn. I like to take advantage and experiment with all kinds of zucchini dishes. This one in particular was delectable. Zucchini paired with delicate sweet corn and savory Parmesan creates a unique and tasty side dish. It takes about 10 minutes; can't beat that! 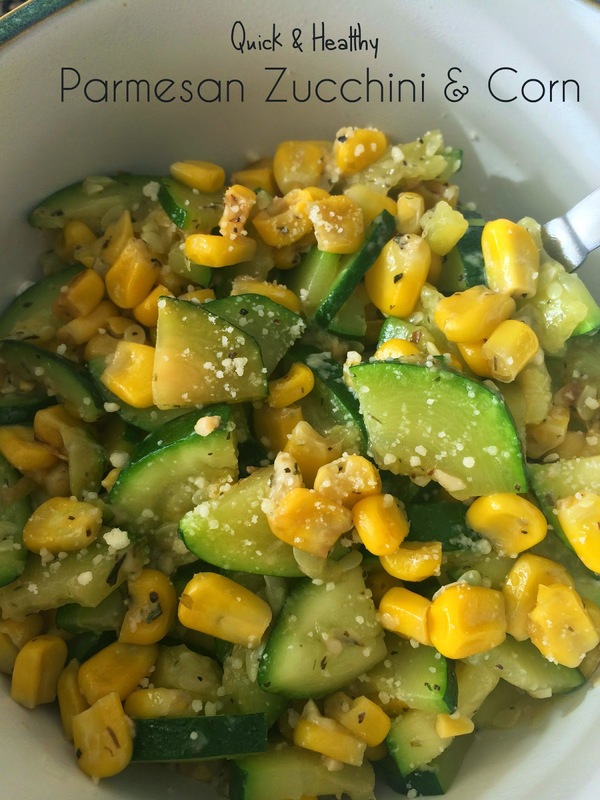 Just chop up the zucchini, add in fresh or frozen corn with some spices, sprinkle in the Parmesan, and voila! Enjoy this light yet flavorful cheesy veggie combination! Heat olive oil in a large skillet over medium high heat. Add garlic to the skillet, stirring frequently, about 1 minute. Add zucchini, corn, basil, oregano and thyme. Cook, stirring occasionally, until zucchini is tender and cooked through, about 3-4 minutes; season with salt and pepper, to taste.